The immediate cause for issuance of the order was the black market in Southern cotton during the Civil War. Northern textile mills — as well as the Union Army itself — relied on cotton from the south. Although President Lincoln allowed limited trade in Southern cotton, it was not enough to satisfy demand. Cotton prices soared on the black market, and unlicensed traders openly bribed Union officers to allow them to buy cotton without a permit. To Grant fell the task of shutting down the black market in unlicensed cotton. 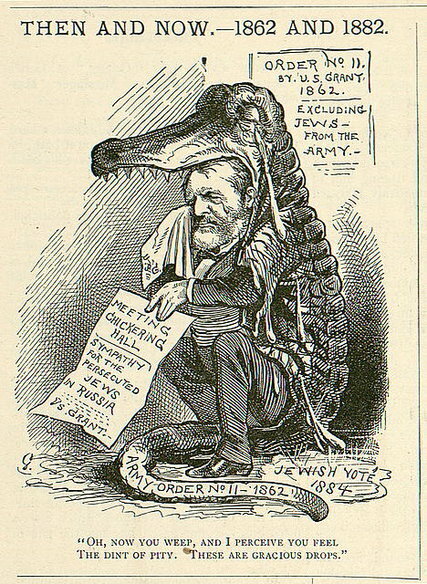 While very few of the illegal traders were Jewish, Grant fell sway to the anti-Jewish prejudice of his day. He ordered that no Jews were to be permitted to travel on the Rail Road southward from any point. “[T]hey are such an intolerable nuisance,” he said, “that the Department must be purged” of them. In 1885, as he lay dying of throat cancer, Grant wrote his personal memoirs, considered by many to be among the best presidential memoirs of all time. Unfortunately, they make no mention of General Order No. 11. But if actions truly speak louder than words, Grant did, in the end, do much to atone for his wrongs against the Jews. During his presidency, he appointed more Jews to public office than all previous presidents combined. He became the first president to attend the dedication of a synagogue, and actively intervened on behalf of persecuted Jews in Russia and Romania. When his time in office was over, he became the first president to visit what is now Israel. This entry was posted in History, Religion, The Civil War and tagged Abraham Lincoln, Civil War, General Order No. 11, General Orders No. 11, Henry Halleck, jews, Jonathan D. Sarna, Ulysses Grant by Jackie Fuchs. Bookmark the permalink.